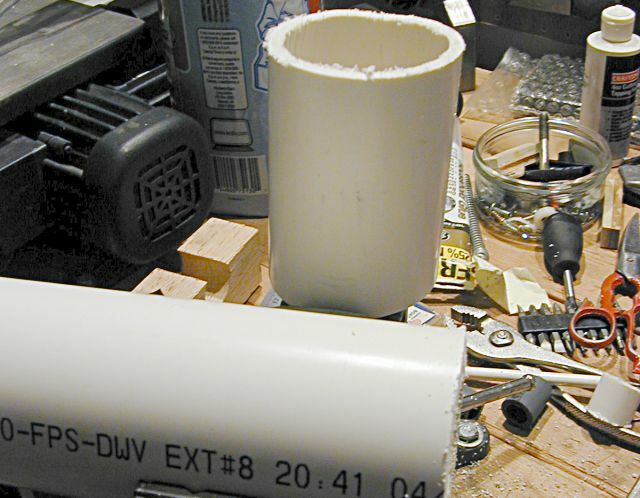 This page is an overview of PVC pipe. Specific questions might be better answered in the homemade water gun, materials, and APH FAQs. If you live in the United States, Canada, Mexico, Australia, New Zealand, and many other countries, PVC is available in most hardware and home improvement stores. In the United States, major chains such as Home Depot and Lowes have very good supplies of PVC. Look for the plumbing aisle. If you live in Australia or New Zealand, read our guide to PVC in Australia and New Zealand. Where PVC can be hard to find, such as Europe, copper water guns are typically easier to build. PVC also can be bought online from websites such as McMaster-Carr. Look for pressure rated pipe and fittings. Check the pressure rating as well—if the rating is below 150 PSI (at 70°F), avoid that pipe so you have a good pressure rating. Typically most fittings 2 inches and small are pressure rated. However, larger fittings may be hard to find pressure rated locally. Ordering off the internet from places like Ewing Irrigation can provide pressure rated fittings then. This guide explains how to identify pressure rated pipe and fittings. One thing to note that the guide does not is that fittings labeled NSF-61 are also pressure rated. Some pipe and fittings may be labeled DWV, cellular core, or drain. Do not use those pipes because they are often not pressure rated. However, be aware that DWV pipe and fittings can be pressure rated but most often are not. If the pipe is DWV and has a pressure rating, it is fine to use. If the fitting says NSF-DWV and has longer sockets then it likely is pressure rated. DWV pipe and reducers can be used in the pressure chambers given that the pressure rated endcaps and coupling overlap the pipe for a stronger pipe, but no pipe manufacturer would suggest such a practice. DWV pipe and fittings have been tested to withstand over 100 PSI or pressure, so they are plenty strong for a simple water gun application given that the pressures don't run too high. These types of pipe, especially drain pipes, are good for constructing non-pressurized vessels such as water reservoirs and backpacks because they are cheaper and lighter than pressure rated pipe. Another label you might see on the pipe would be the pipe schedule. The schedule refers to the thickness of the pipe essentially. Schedule 40 (commonly abbreviated sch. 40) pipe is standard pipe that should be good for most applications. A thicker pipe called sch. 80 pipe usually is dark grey as opposed to white and has a higher pressure rating due to the increased thickness. Because schedule 80 pipe is harder to find, more costly, heavier, and carries less water, sch. 80 pipe is not suggested unless the gun requires very high pressure. Working with PVC is pretty easy. To make an APH, you'll need a small saw (like a hacksaw), a drill (a hand drill or drill press both work fine), a clamp to assist in cutting pipe, drill bits, and scissors. There also are special PVC cutting tools, but you don't need them because a saw cuts PVC fine and does other jobs. Be sure to use eye protection as well, because much the tasks here can involve little PVC bits flying off the pipe. 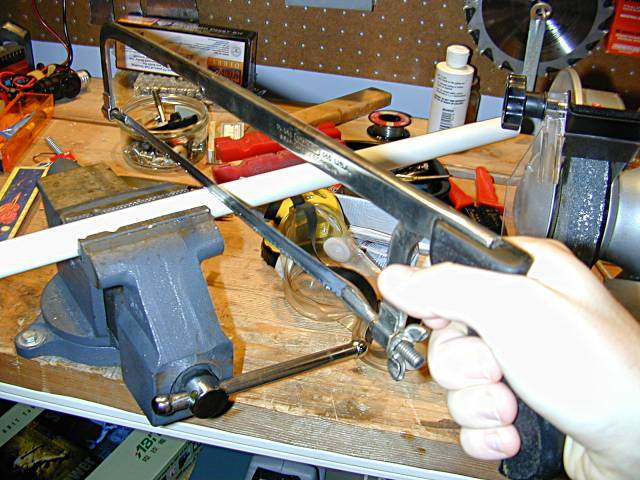 In the image above I am cutting 1/2 inch PVC pipe with a hacksaw in my clamp. The clamp is tightened on the pipe to keep it steady. Don't tighten the clamp too much though. You can and will permanently warp the pipe shape if you tighten too much. 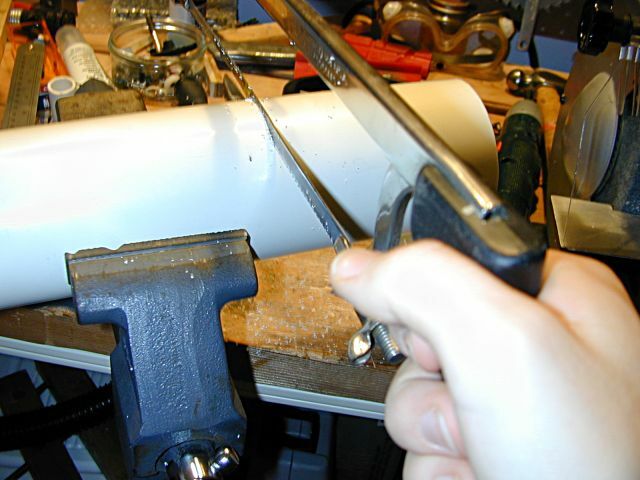 Be sure to cut straight into the pipe, or else you'll end up with a piece that is cut at an angle. 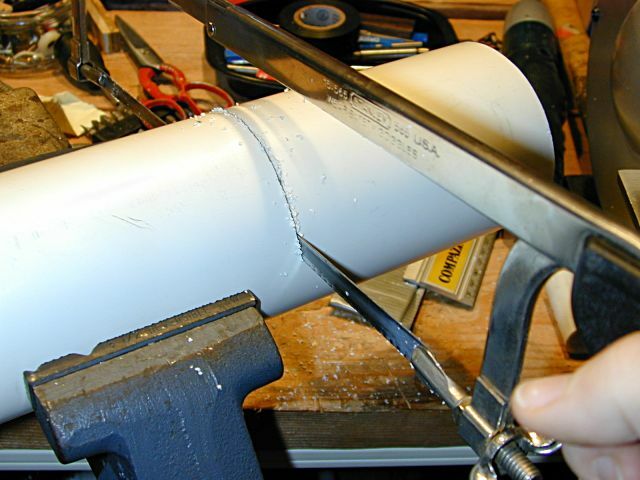 PVC bits will come off the pipe as you cut, so I suggest cleaning up afterward. The pipe will have burrs where it is cut. I use scissors to remove them; some others use files to file off the burrs. The image has the burr detail on the left. When cutting large pieces of pipe, be sure to start the cut straight. With a long pipe to cut through, being off by more than a few degrees makes a very noticeably angled cut. Not all clamps will be able to fit larger pipe as well. My clamp can fit 3 inch pipe, but not 4 inch pipe. You might have to figure out another way to hold the pipe down to cut it. I've sat on larger pieces of pipe when a clamp wasn't available. In this image you can begin to see a potential problem with cutting larger diameter pipe. The top of the hacksaw will run into the pipe. At this point, rotate the pipe so that you don't have to cut straight through it. Cut a bit at a time, loosen the clamp, rotate, tighten the clamp, cut, and repeat. If you cut straight, you'll end up with something that looks like the above. The above image shows how I drill the nozzles in threaded caps. 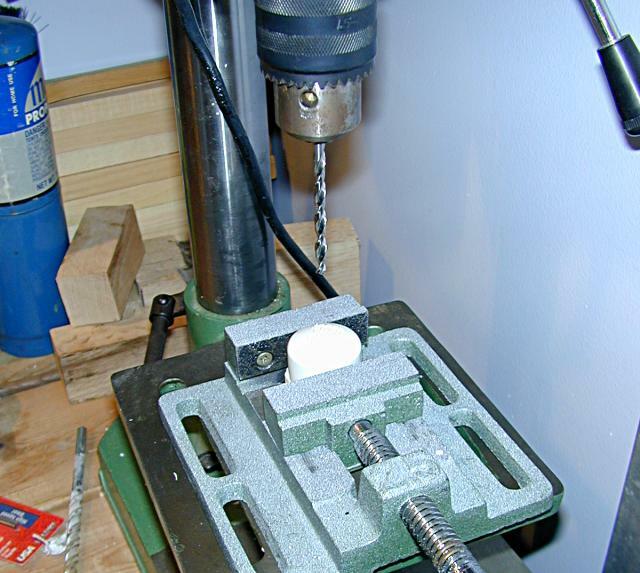 I have a clamp that I can use with my drill press to hold the caps in place. I then take the drill bit that is the size I want in my nozzle and drill through. As you drill, be sure to drill completely through and move the drill up and down to make a clean cut. After that, clean the nozzle with scissors like you do when removing the burrs from the pipe to have a cleanly drilled nozzle. You can drill whatever size nozzles you want into a threaded cap, given that the size is smaller than the cap. To switch nozzles, simply unscrew the cap and screw on a different one. Read how to solvent weld in our FAQ. You also can look at the cementing page to see how to solvent weld with pictures.